It's a bitterly cold morning as I walk out from my apartment building. The sound of the snow crunching underneath and the sharp needles of cold invading my lungs. It brings back memories of my native Canada. This is the second consecutive cold winter here on the Alley as the majority of streams have been locked in ice since past December. Last winter was one of the coldest since I've been living in Ohio and this winter wasn't too far behind. Fishing the streams seems to be a distant memory and I long to fish them. The plant is the only option and I'm not thrilled at the prospect of fishing it. But if I don't get out, I fear I'll go insane. "Dude, where the hell are you going to fish? Everything is frozen over? Smiling, I tell him I have a little oasis and the water is warm there. He gives me a puzzled look and said "Dude, you're crazy and stay warm"
Mike gets in his car and leaves for work. Driving west on the interstate, I can see the stacks in the distance bellowing smoke. The water should be very warm as the plant has been running non-stop for the past few days. For once, there isn't any wind coming across the ice. I pull into the lot and dress. Some passing motorists stare at me probably thinking I'm crazy. I dressed warm from head to toe and I look like I'm ready to explore the dark side of the moon. I waddled off towards the beach. I walk along the shore and there's gulls, ducks and geese everywhere. Hundred of birds scatter as I walk. I see nothing but ice as far as the eye can see. This is probably the only open water for many miles. 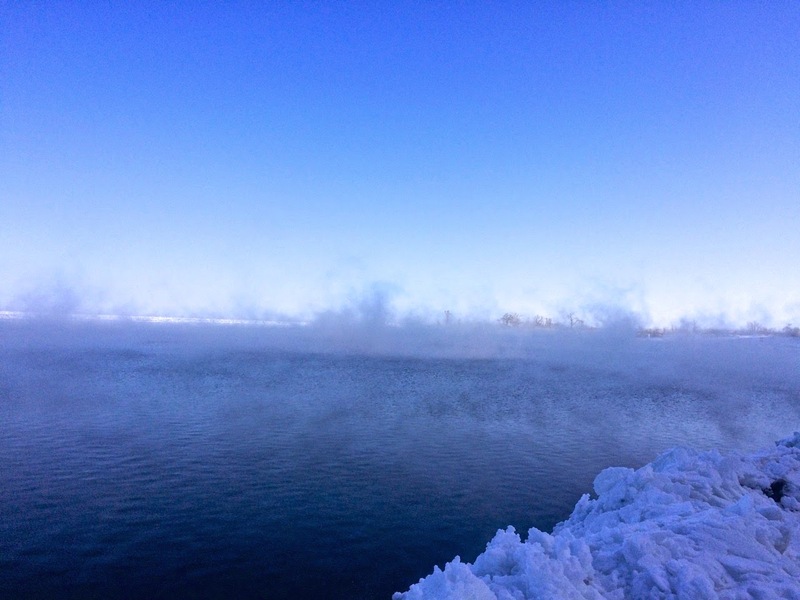 The steam dances along the surface as I can barely see the point. Halfway there, my cheeks are starting to burn from the cold. I check the phone and the temperature reads 5F. I turn the corner around the point and enter the plant's discharge pool. I can see waterfowl everywhere and several birds take flight as I wade through the water. There's mergansers, buffleheads, redheads, scoters, scaups and coots. All of these birds are after one thing - food. The warm water here attracts baitfish. But even with all of the fish, some of the birds have died of starvation. I see a redhead duck huddled on a rock shivering. The plant has nothing offer him and I feel pity for it as I know it will probably not survive the night. I climb over several rocks and I make it to the discharge. I see several scoters diving and popping up with crayfish in their bills. When I'm fishing the discharge, I bottom bounce. My rig that consists of an egg sinker and a 3" gulp minnow. The pattern doesn't really matter because the fish will attack anything resembling a baitfish. I cast out into the current and let the sinker hit bottom. I feel it tumble about and I jig the minnow several times to entice a fish into biting. During that time, I watching for mergansers that might catch a glimpse of my minnow and dive for it. Last winter the number of mergansers in the back were so numerous, I couldn't even fish. Whenever the minnow hit the water, a dozen of them would dive after it and cut the minnow in half or even worse get hooked. It's not fun trying to haul in a bird as its flapping about. If I was lucky they would get hooked in their hard bills and it would easily come out. The biggest pain was whenever a bird got snagged in the wing or neck. To prevent injuring a bird, I would push the barb down so removing the hook would be quick and painless. The plant is a bustling place as I hear trucks blasting their horns, loaders hauling coal and odd person barking over the loud speaker. This year, the loud speaker has been quiet. In past years, I remember constantly hearing somebody telling us to stand back from the buoys. We would stand there and ignore them. Several times the police would be called but there wasn't anything they could do as we where standing the lake. The lake bottom by law is public property. The police officer didn't like making the walk through the snow. He would try to explain that the plant was concerned that we would drown. We assured the officer that the water was clear enough that we could see the drop off. He checked for fishing licenses and with that he left. It's cloudy this morning and the number of birds is very low, maybe a couple of dozen or so. 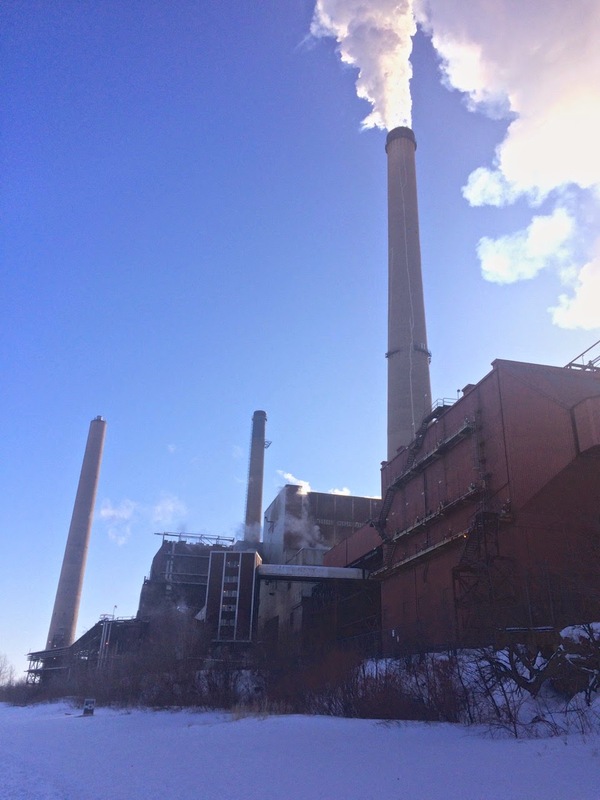 From what I heard, the plant was slated to be closed down in the spring as new EPA emission rules made the plant obsolete and expensive to run. It had been a fixture on the lake front for over 40 years. Lucky for us, the federal government kicked in some money to upgrade from coal to natural gas, so that meant our precious oasis was saved from the wrecking ball. The number of baitfish in the plant this season has also been very low. 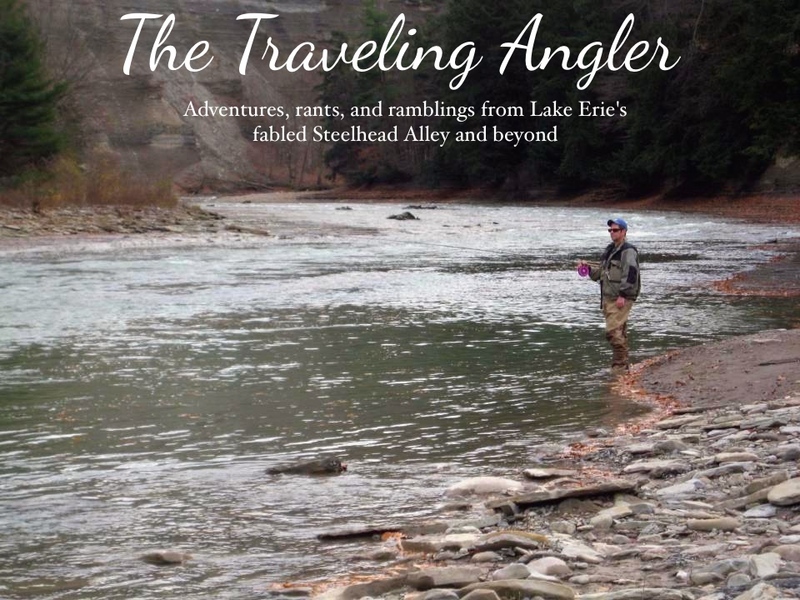 But it hasn't stop some of the steelhead from returning. I begin the process of working the discharge. So far this season, it has been feast or famine. So far, I'm hungry for a hit as my fingers are getting cold. I jig the minnow and I feel a tap and then a surge. I set the hook and feel the fish charge. In the distance I watch a skipper leap out of the water. The fish darts about in the shallows and I corral it into the rock. The larger hook makes it easier to pop it out. I watch the fish bolt for the deeper water. Then it turns into a long drawn out process as I cast over and over. Something isn't right. I figured there should be more fish in here. In past years, I would of reached double digits by noon. So far I have two fish and I'm thinking the point might be better. I switch from bottom bouncing to a float with a jig. For decades, the current has dug a long trough along the breakwall and goes out to the lake. I tie on a white jig and set the float for about 7' and cast right along the ice. I wade out as far as I can go before the crystal clear water turns into a deep green drop off. A small flock of mergansers cruise along the rocks and periodically stick their heads in the water looking for any bait. I cast out and watch the float drift out into the lake. Due to the cold, the line on my spinning reel has stiffen and I have to yank the rod to get the line through the guides that have iced over. I strain to see the float and nothing happens. I repeat the process over and over and I'm making adjustments. I wonder the bright sunshine has moved the fish under the ice. I finally get a fish and I watch it leap from the water. It's another small bright silver skipper and I quickly release it. Then it turned into a grind as I worked along the ice. 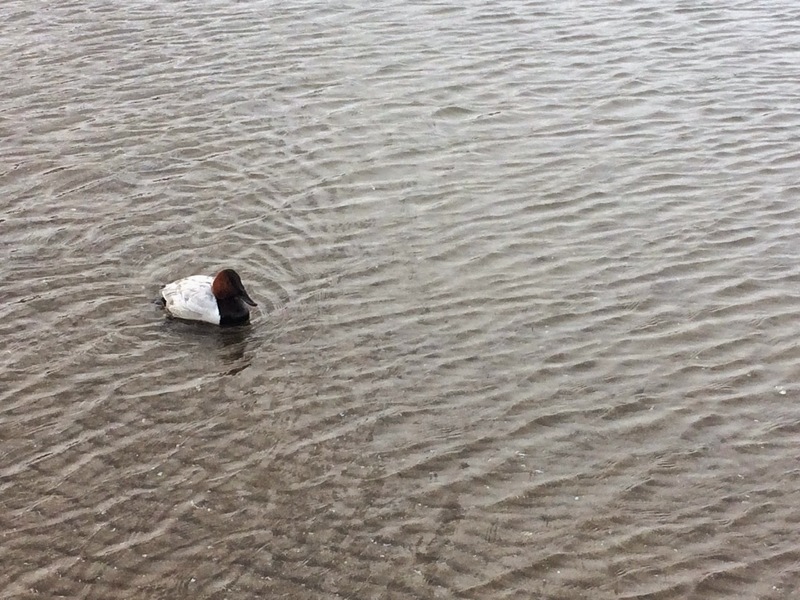 Boredom begins to take over and the only thing that sparks my interest is canvasback duck that is bold enough to swim up to me. Something doesn't look right as the duck patiently lingers as if he's expecting me toss out some food. Whenever I reel in my minnow, the duck darts towards it. The warm water discharge is an oasis for waterfowl, but appearances can be deceiving. For some species of ducks, the lake bottom offers very little to no food for them. Mostly likely it was starving and probably wouldn't make it when the ice melted from the marshes. I watch the duck gradually swim off. In the distance, I watched what I though was another angler walking along the beach. He had two box like objects in hand and net on his back. As he walked closer I didn't see a rod on him. He stopped and took out some binoculars. I figured he was a birdwatcher. I looked over and he was trying to coax the canvasback to come near him, but the bird wouldn't come and he motioned to me to come over. Bored with the fishing, I wade over to see what he wanted. He introduced himself as volunteer for a wildlife rehab center and he was trying to rescue sick waterfowl. He told me he noticed the duck would come near me whenever I tapped the rod in the water. He went on to say that he and others would nurse as many birds back to health as possible. He seemed genuine and concerned about the well being of the birds. I took his net and lured the duck in. He paddled close enough that I was able to swipe the net and get him. He gently took the duck out of the net and placed it in the cardboard box. I told him about a heron and other ducks in the back that were weak. However he didn't have any waders so he couldn't help those birds. The cold and lack of fish was enough for me call it a day. It's early March and spring seems so far away. I'm longing for the rivers and the warmer weather that will free the rivers of ice and snow.